If your chickens are like mine, they enjoy eating. As we have a smaller coop, I use the Little Giant 3 pound hanging feeder for the girls. It fits great in the coop and I only have to fill it every couple of days or so, that is when the girls are behaving. The chickens enjoy “scratching” around in the feeder as they sort out and pick the best morsel to eat, even though all of them look identical to me. When the girls scratch around, they inevitably scratch some of the food right out of the feeder. To minimize spillage and waste I did a few things. 1. Used a feeder that has an outer lip/rim. 2. Used a hanging feeder. 3. Used pellets vs. crumbles for feed. 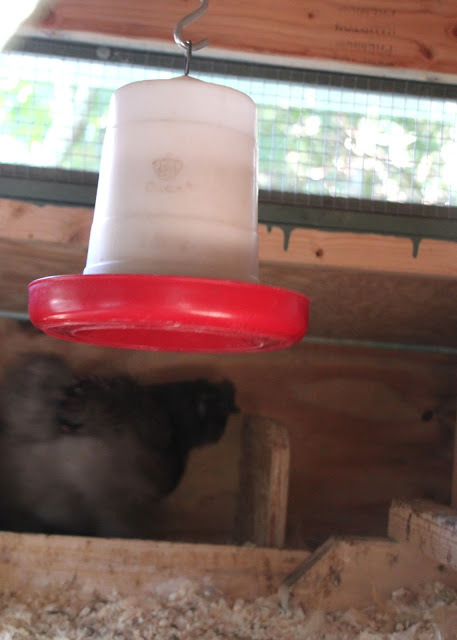 The hanging feeder and Dolly seeking the perfect nesting box. However, even this was not enough. Sunshine was on my list. Her new favorite habit has become emptying the feeder entirely as soon as it was filled. I would fill it to the top, and by late afternoon, it would hang, empty blowing in the breeze with all the food scattered in with the pine shavings on the floor. I tried to outsmart her. 1. I began to fill the feeder with only enough food for the day. 2. I tried to distract the girls with more free-ranging and hanging cabbage pinatas in the run. 3. I refused to refill it until they ate most of the food off the coop floor. And so it went, like this for weeks on end. I began to research other feeders available that would fit inside my coop. Sure, they had a plethora of larger ones that could go outside in the run, but I don’t like to keep food or water in the run “after hours”, as I feel it can attract scavengers including mice and rats. Then, my prayers were answered. A fellow chicken owner on Facebook, posted their idea to my problem. So I decided to try it. All I needed was a small piece of chicken wire and a pair of wire clippers. I had both. The idea was brilliant and simple at the same time. The idea was by placing a layer of chicken wire over the feed, you could eliminate the girls spilling the food, while they still could access all the food. 1. I took apart my feeder by detaching the metal arm and nut that ran through the feeder. 2. I cut a larger piece of chicken wire in the shape of a circle that over hung the edges by about 3 inches. 3. I put the feeder back together making sure that the food could still have enough room to get through the dispensing holes. 4. 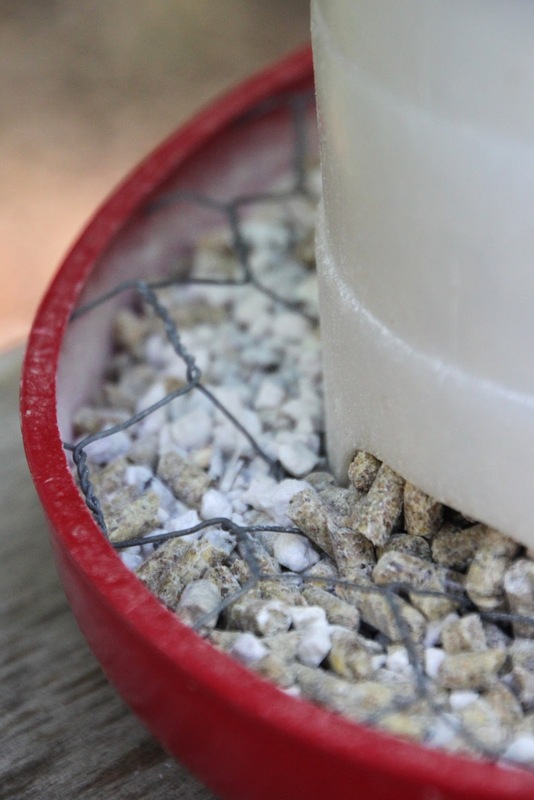 I trimmed the edges of the chicken wire allowing them to over-extend the edges of the feeder by a tad bit. These edges were sharp. 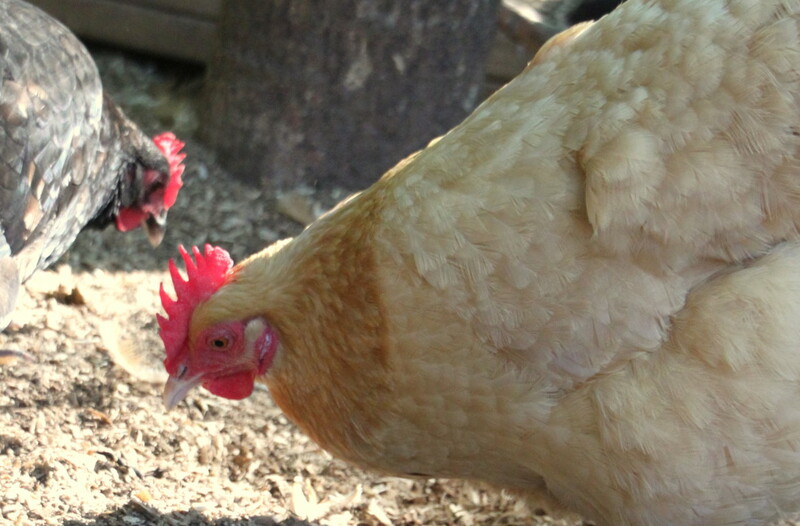 I tucked the edges under the lip of the feeder, so they would not be able to harm the girls by scratching them, pecking an eye out or anything else imaginable, chickens have a way of finding trouble. The sharp edges could also be duct taped with large pieces of tape that the girls could not swallow if they removed them accidentally of course. DISCLAIMER: If you chose to create something like this for your feeder, there is no guarantee that your chickens will avoid harm. 5. I then refilled the feeder and rechecked that the edges were still where I had placed them. 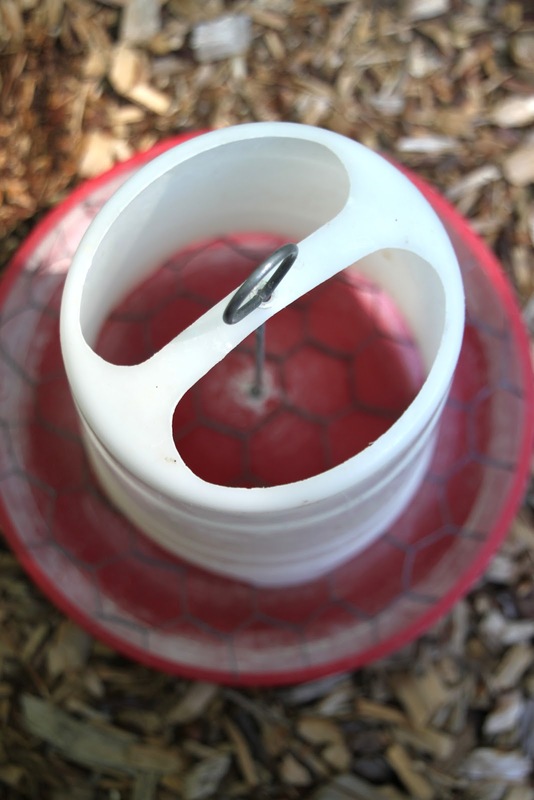 Chicken wire runs all the way through the base of the feeder, sharp edges are tucked beneath. 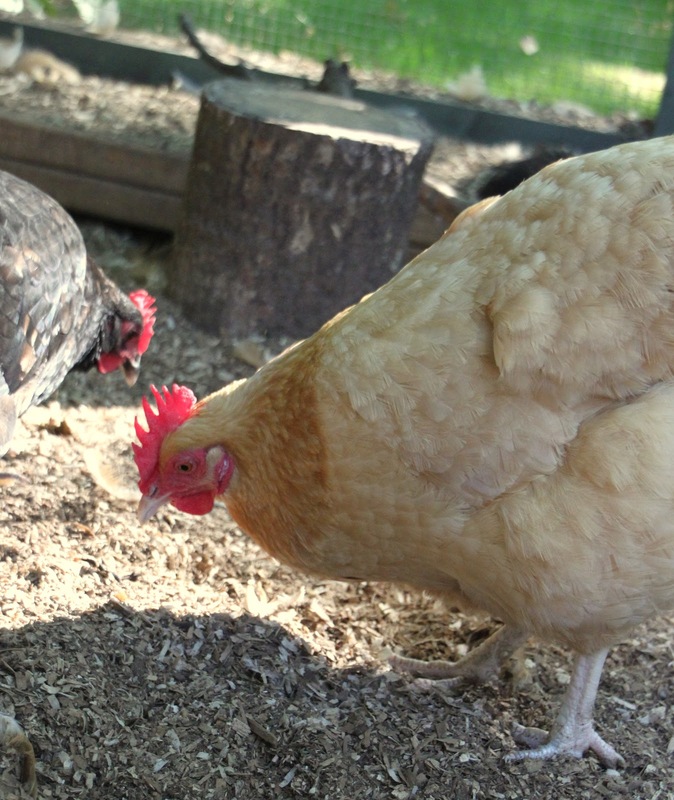 Before placing the feeder back in the coop, I cleaned out all the pine shavings. This was an experiment. I had to have a clean laboratory. All clean, I hung the it back. So far, it has been about 5 days and there is no spillage whatsoever. Everyday, I expect to see even one pellet on the floor. I am happily disappointed to find not a one! A huge thank you goes out to Cliffside Chicken Ranch from Tilly’s Nest for showing us the way!